Giovanna Salabè was born in Rome in 1963 of an Italian father and a German mother. She grew up in an international and multilingual environment. Very early in life she felt drawn to Art, Literature and Theatre. From the age of fifteen onwards numerous travels led her to the capitals of Europe and doing so to the theatres, concert halls and museums of many still unknown cultures. Her musical training started at school with eight years of classical guitar lessons and from 2008 to 2010 with Johannes Tonio Kreusch in Munich. After the completion of A-Levels in 1982, she finaly left Italy in order to qualify in Musical Education at the University of Regensburg (Germany). The awakening towards Theatre, her old passion, takes place exactly in this period. She wends her way to stage. 1985 she plays the Role of the Girl in the play Die Versicherung of P. Weiss directed by Ulrich Pöppl in the Studententheater Regensburg. 1990 at the Scuola Teatro Dimitri in Verscio/Switzerland and 1991 with Desmond Jones in London Giovanna still moves between Commedia dell’Arte and Mime. At this point in time she is not yet able to give a name to the undefinable longing for an autentical expression of voice and body. 2004 she comes across Dominique De Fazio – Protégé of Lee Straßberg (Actors Studio) – and his Program for Professional Actors in Rome, Milano, Munich and Hamburg and finally finds what she was looking for: the Poetic Theatre. 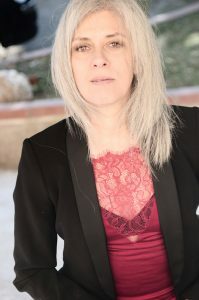 Giovanna’s continuing urge towards writing poetry led her to win the Youth Literature Prize of the Regensburger Schriftstellergruppe International in 1988 and the Literature Prize „Amalia Rosselli“ (Rivello/Italy) in 1998. Giovanna trained from 1997 to 2001 as Heilpraktikerin (“healing practitioner”) and Shiatsu-Therapist and concludes in this way an abundant gathering phase. Following her multiple parallel interests, her limitless curiosity and her thirst for knowledge led her to explore the most diverse branches of creativity. The years of creative production follow. In this life phase of Giovanna’s everything is concentrated towards theatre. As Giovanna was assistant director of J. Berlinger – 2004 the play Die Pfarrhauskomödie (H. Lautensack) at the Turmtheater Regensburg – she gains a vast experience in the field.Thanks to her fully developed know-how she manages to face all practical and aesthetical challenges of theatre production. For her this was a professional cornerstone so led her to opening Grenzgänger, her own theatre project in Regensburg from 2005 to 2007. A private stage production was completed with refugees from Afghanistan, Iraq and Bosnia, which was based on the causes of fleeing and the escape routes of the actors involved. On moving to Berlin in 2009, the new project Teatro delle Voci, an Audio-Installation with walkable stage is performed. Interviews originating from southern Italy, which had been worked into Voice-Collages resound in three rooms. Thanks to the Italian Institute of Culture (IIC) and the Cultural Association Malaparte e.V. the spectators themselves experience space and sound space by wandering around the stage and walking through the voices of men and women from the South of Italy. In 2010 and 2011 Giovanna returns to the stage as a performer in both plays of M. Majce, Ein Aufenthalt (Ballhaus Ost) and Within the Enterim (Hebbel-am-Ufer2). This experience was less about a play and more about mobility and mobilization of scenery. Here is where she got most of her inspiration for the scenery of her own theater play Schlaganfall®. Here too the spectators are included within the scenery and involved at close quarters in the event. In Berlin, from 2010 to 2013, she commited herself to adolescents with migration background and developed the theater projects, Ick bin een Berliner and Turn Tears to Fire. Two private performances of the theatre work emerged through the support of Hoftheaters Kreuzberg e.V. Both plays address the difficulty of a life between two cultures. In the 2016 play Schlaganfall® (www.schlaganfall-theaterstueck.de) written by Giovanna, she combines her experience in theatre and therapy where all so far explored, lived and experienced flows together. Alongside her external productions Giovanna never neglected her inclination for poetry. Since 1993 she developed her individual concept for theatre and poetry seminars (www.poetryflowers.com) and released her own poems. 2003 and 2006 her volumes Libruch (homo migrans editio) and Xàos (Athena Verlag) were published.